Think beyond relish, onions, and mustard — top your dog with rainbow slaw, carrot-raisin salad, or housemade halal chili. There's room to be creative at Dogtown Sausage. Few foods are as nostalgia-inducing as a hot dog served on a soft white bun, topped with relish, onions, and bright yellow mustard. Whether it’s at a baseball game or a street vendor’s cart, your basic hot dog is reliable comfort food. Some traditions are better left untouched, and some people might argue that hot dogs are one of them. But Dogtown Sausage in East Oakland challenges that notion. The shop, which opened last September, is owned by Abdul Ali, who grew up in an apartment above his father’s shop in West Oakland’s Dogtown neighborhood. 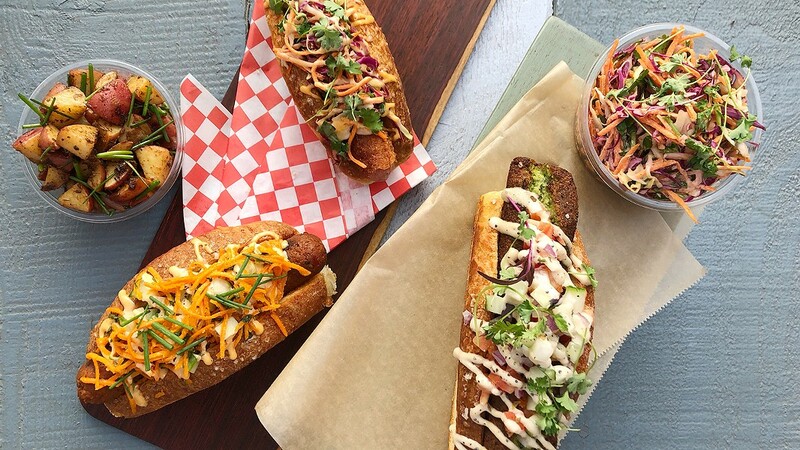 Here, the mass-produced white bun gets an upgrade to a housemade Japanese milk bread bun, there are pork-free sausages ranging from hot links to lamb to veggie chipotle, and the options for toppings run the gamut from rainbow slaw to curried carrot-raisin salad. There’s also a creative menu of signature hot dogs, like the chicken-fried chicken dog or the Wagyu steakhouse dog. “We’re always looking to find ideas that are gonna be really craveable,” said Justin Nilson, who worked with Ali on the design and menu. Alternatively, customers can exercise their artistic freedom by building their own custom dogs from the ground up, starting with the blank canvas of the split-top bun, choosing a sausage, and ending with a colorful palette from the condiment bar. The split-top bun here is a thing of beauty, toasted on the outside to a dark brown with a shiny, egg-washed top flecked with sea salt. And the bun tastes just as good as it looks: crisp on the outside and fluffy, light, and mildly sweet inside. The bun was an ideal backdrop for all the different sausages and toppings I tried. The Bull Dog, my favorite of the signature hot dogs, is a juicy hot link topped with cheese sauce, grilled peppers, and grilled onions. The hot link and cheese sauce were satisfyingly salty, and the sweetness of the bun and caramelized onions provided a welcome contrast. The chicken-fried chicken dog was another winner, breaded in panko and potato flakes to give the exterior the texture and appearance of fried chicken. It wasn’t quite as crisp as my favorite fried chicken, but whatever crispness the breading lacked was more than made up for with the crunchy rainbow slaw on top. The slaw was full of chopped red and green cabbage, shredded carrots and cilantro, and the spicy mayo added a hint of cooling creaminess combined with a hint of heat. Though the hot dogs here are portioned pretty well, those with particularly ambitious appetites may want to upgrade to the Steakhouse Dog, a foot-long Wagyu beef hot dog that hangs over both sides of the bun. This one arrived topped with roasted red potatoes, blue cheese crumbles, grilled peppers, and grilled onions. My only gripe was that I wished it came with some kind of sauce to tie it together. Luckily, guests can add their own from the well-stocked condiment bar. I tried my hand at a custom dog: a lamb sausage topped with a curry carrot-raisin slaw. The lamb sausage was excellent; it had the unmistakable flavor of lamb without tasting gamey. And the curry carrot-raisin slaw is a worthy addition, with notes of sweetness and spice. Don’t miss the sides, either. I opted for the chili cheese fries, topped with gooey yellow cheese sauce and housemade chili. The chili is made with fire-roasted tomatoes, along with black beans, kidney beans, and bits of halal ground beef. It was definitely heavy on the tomato and light on the meat, but after a meal of hot dogs, I didn’t mind. But the dish I was most surprised by was the quinoa salad, made with squash, zucchini, and fresh parsley harvested from the herb garden on the back patio. The quinoa had a nutty, toasted flavor that was complemented well by the light lemon vinaigrette. Nilson said the recipe was inspired by Mediterranean dishes like tabbouleh. “I lean a lot towards Mediterranean-type dishes — things that are really bright, colorful, flavorful,” he said. Even the drinks here have received careful consideration. The housemade lemonade is pleasantly tart and not too sweet, plus there’s a housemade hibiscus iced tea. And the opportunities for creativity here go beyond building and eating a hot dog. If guests want to memorialize their creations, there’s a photo printer at the cashier where guests can print a photo of their concoction, give it a name, and list the ingredients on a recipe card. The recipe cards are displayed in the shop’s hallway. And though the bathroom walls are decorated with a drawing of a dog writing lines that read, “I will not write on walls,” guests are invited to write or draw on the bathroom walls using the pens provided at the register. “Especially here in East Oakland ... there’s just an astonishing amount of creativity,” Nilson said. Some people have filmed YouTube videos at Dogtown Sausage, and Nilson plans to invite local artists to work on a new mural for the shop. And once Dogtown Sausage opens its planned larger location in Ali’s father’s shop in Dogtown, they’re thinking about installing a recording studio — Ali’s family includes several budding musicians. Hours: Wed.-Sun. 11 a.m.-9 p.m.